A new report released today warns that, left unchecked, antibiotic-resistant infections could be responsible for 10 million deaths per year by 2050, at a cumulative cost to the global economy of $100 trillion. These jaw-dropping estimates are accompanied by a series of recommendations, from massive educational campaigns to additional research to find new classes of anti-microbial drugs. One of the suggestions is the establishment of a $2bn Global Innovation Fund to look for new ways to kill resistant bacteria. Data from Tackling Drug-Resistant Infections Globally: final report and recommendations (PDF), the culmination of the UK government’s Review on Antimicrobial Resistance, which began in 2014. So, implementing this recommendation comes in at just 0.002% of the potential economic cost of antibiotic-resistant infections. Imagine you find a leaky pipe in your flat. A plumber visits and tells you that, if the pipe leaks out of control and floods the whole building, the damage could cost up to £100,000. A new length of pipe would cost £2. Do you get the pipe replaced? This, of course, sounds utterly ridiculous; but these two numbers are on the same scale as the two from the report. Inevitably, not knowing what the future holds, the $100tn figure comes with massive uncertainty attached. The report notes, ‘it is of course possible that our estimates may turn out to be too large, but we believe it is even more likely that they could be too small’. This is partly because they didn’t account for some ‘secondary’ consequences of a post-antibiotic world, including ‘risks in carrying out caesarean sections, hip replacements, or gut surgery’. You also don’t know exactly what investing $2bn in research will buy you. With plenty of promising methods to develop new drugs and treatments, it’s possible that we might make some serious headway. Equally, it might turn out that far more research is needed: but, even if this effort costs fifty times as much, we’d still turn a thousandfold profit by 2050. 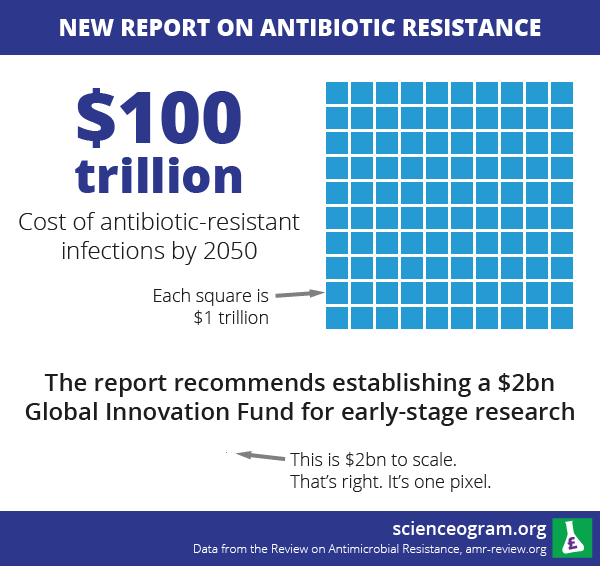 Antibiotic resistance is clearly a case where the Scienceogram’s mantra applies: research is woefully underfunded compared to the scale of the problems that science is trying to solve. Let us hope that the world’s governments take note of this report, and commit to its recommendations—or maybe, given the scale of the problem, we could even stretch to a bit more than 0.002% of the potential future cost.